My sisters visited for my birthday this weekend, so although I didn’t get a lot of knitting done, I did have a lot of fun. One of my sisters wanted to try spinning, so I got her set up and she made a little skein of yarn after a lot of effort. 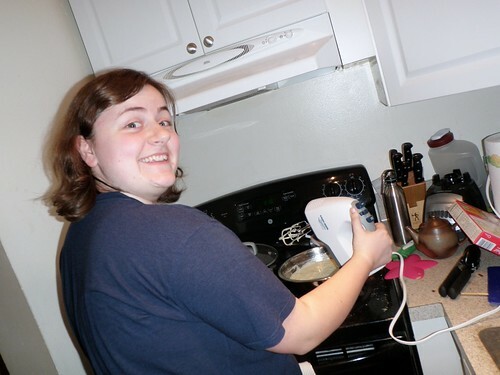 Meanwhile, my other sister baked the cupcakes. 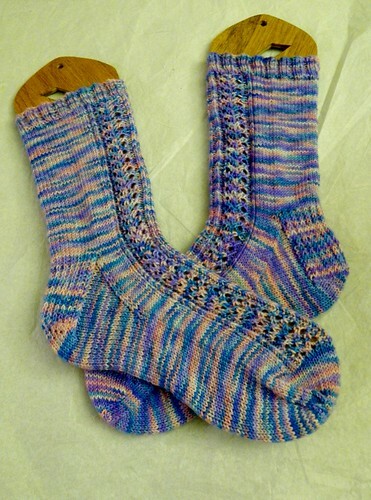 And I cast on for this year’s birthday socks! 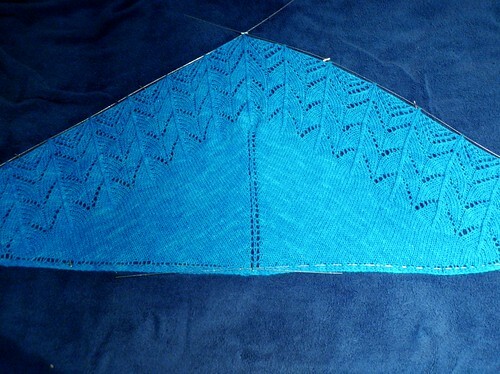 The yarn is Regia Mosaik Color – as you can see a bit in the picture, the yarn is dyed with extremely short color sections – about one stitch. It gives an interesting effect! 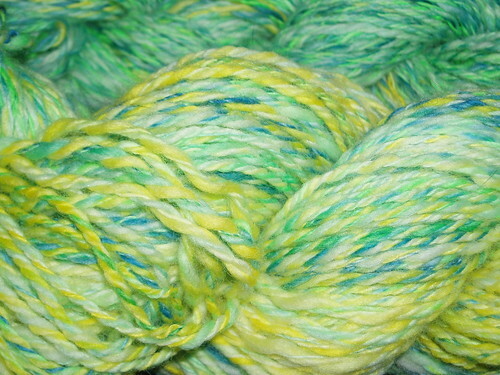 Although this yarn is sort of crazy-bright, I was inexplicably drawn to it. 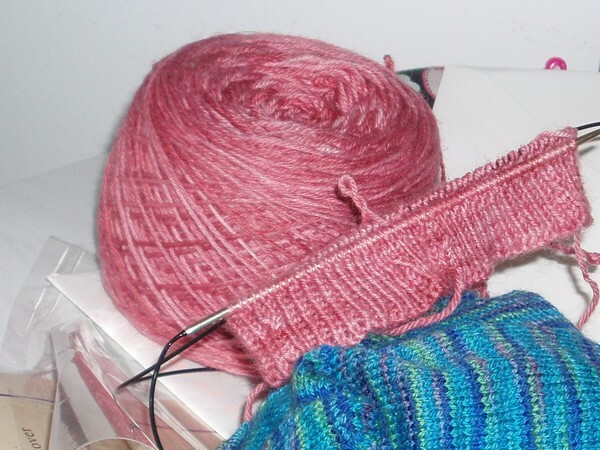 I was inspired by my 2007 birthday socks – I do like to wear plain stockinette socks, and I usually have a pair living in my bag for bus knitting, so I knew I needed to start one for my birthday. Maybe this will become a yearly tradition! 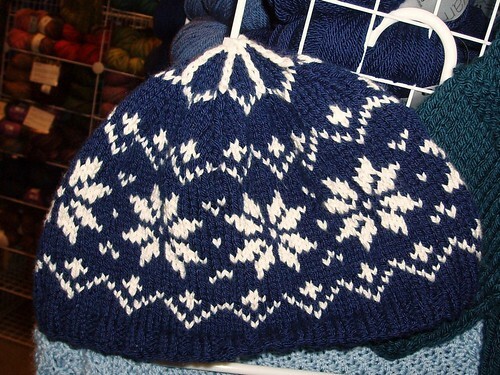 First, I knit this hat – which *used* to be the Alpaca Ski Cap – for the store. 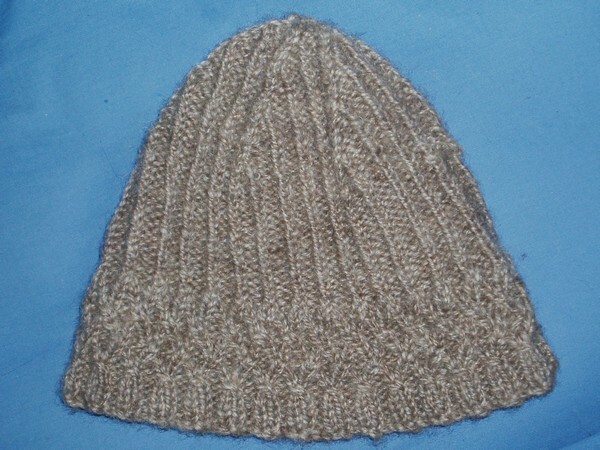 The yarn that was originally used was discontinued and so I knit it in some lovely Cashsoft Aran. Another bonus of working in a yarn store is that you get to knit things you wouldn’t make for yourself, but still enjoy knitting. And on the first Friday of each month, there is a spinning group that meets. The owner was kind enough to lend me her folding Lendrum since my Kromski Symphony isn’t very portable. I grabbed some fiber on the way out the door yesterday morning and got a bit of a surprise when I went to spin it. 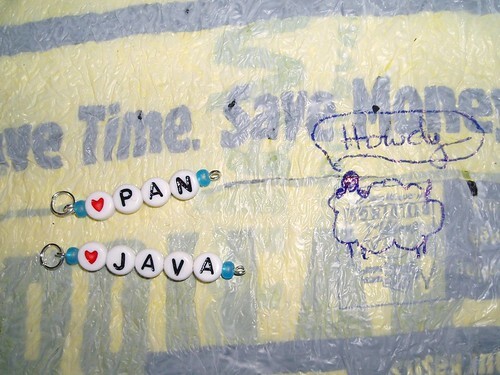 There were two little braids of fiber labeled “Alpaca” which I believe I got from a secret pal at some point. Well, I pulled it out and it certainly wasn’t like an alpaca I have used! It had a lot of guard hair and really didn’t feel like alpaca to me… not the soft squishy fiber most of us are used to. I don’t know if it’s just a different kind of alpaca or if it’s llama perhaps? In any case, it spun up quite nicely anyway. I was jokingly calling it “fake alpaca” all night. 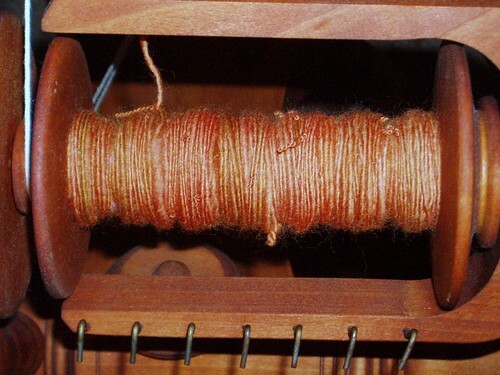 The resulting yarn is not as even as I usually spin, but it was a new wheel for me and it’s a single treadle with scotch tension – much different than my large double treadle double drive wheel. All things considered it turned out well! 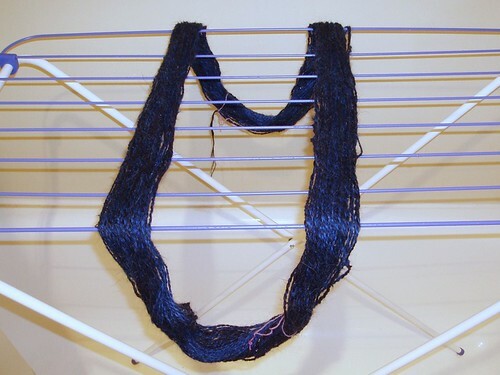 Here’s the mystery-alpaca plied and drying in my bathtub. 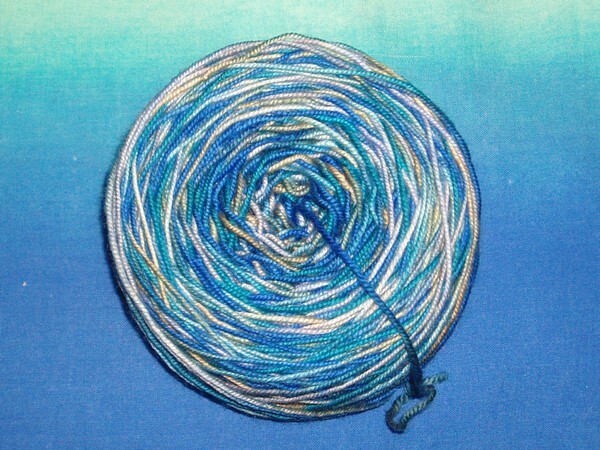 There were two colors, a navy and a brighter blue, so I plied them together for a barberpole look. I like it! You can see the barberpole effect in that picture, as well as the guard hairs. 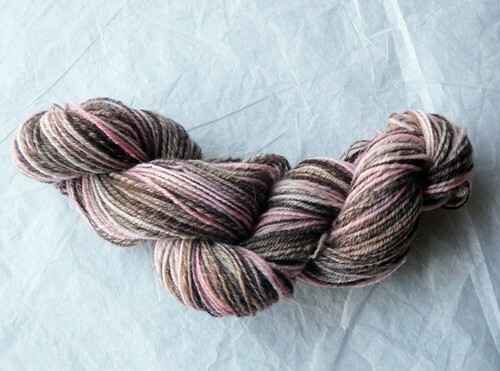 The yarn looks a bit fuzzy – like you’d expect from an angora yarn, but isn’t quite as soft. 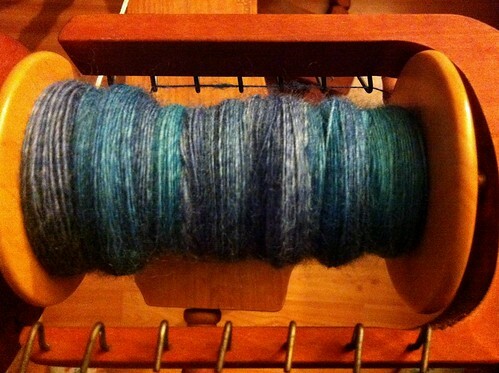 I’ve been doing some other spinning lately, but this one at home. 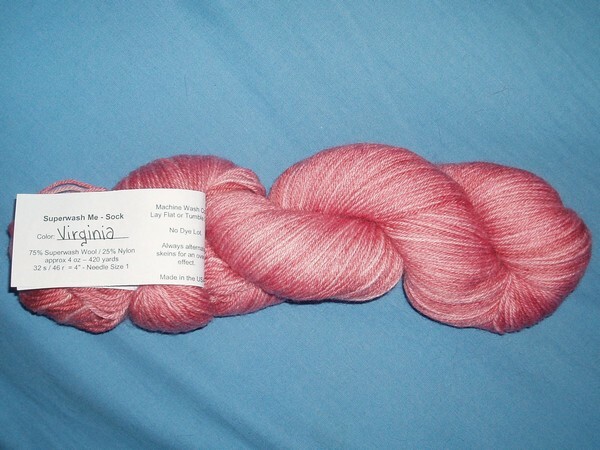 At Sock Camp my roommate Marisol bought one of the Sheep to Shoe kits, but wanted a worsted weight yarn. 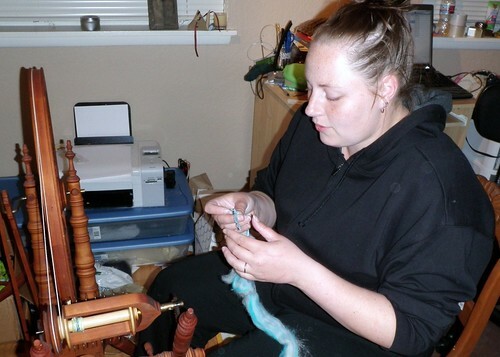 She’s just learning to spindle spin, but decided that since the fiber wouldn’t fit in her suitcase and she wasn’t sure how fast she could get it spun, that she’d leave it with me. The colorway is “The Claw” and this part kind of matches my wheel! 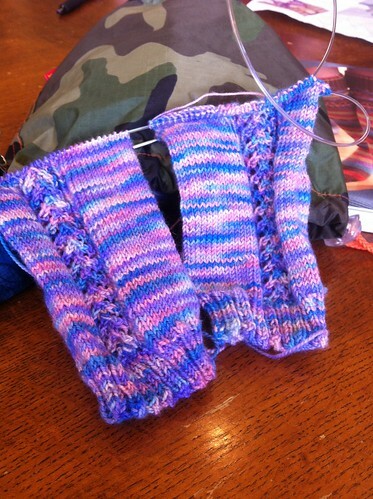 The color repeats are very long, so I haven’t hit the purple yet. Stitch markers with the names of my (usually) beloved cats in an envelope that appears to be made from plastic bags! My poor neglected blog! The last couple of week and a half have been filled with friends, way too much of a social life, and not too much knitting. Oh, yeah, and spinning. 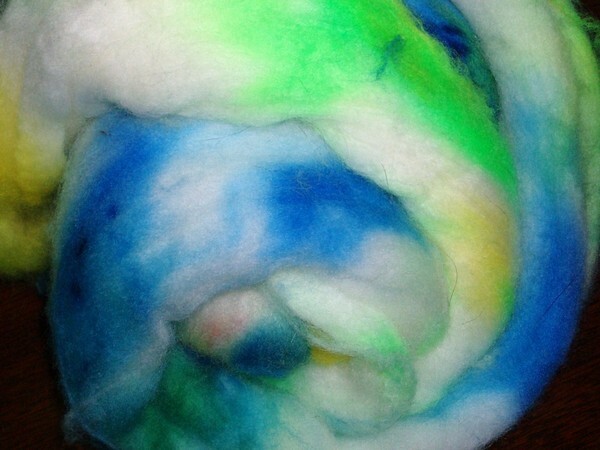 I did complete my Tour de Fleece goal and finish spinning my birthday roving! 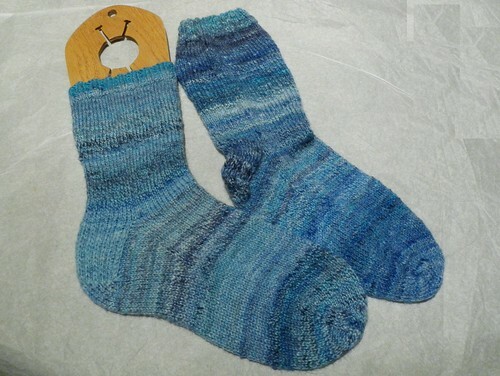 I think in a little less than a month the birthday handspun can become my cross country road trip socks. 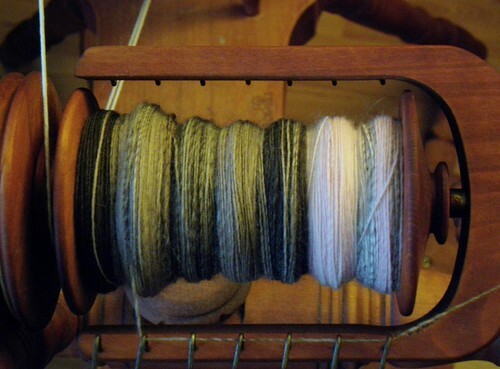 I made a true three ply for the first time – I plied most of the singles until the bobbin was as full as I could get it, then skeined that bunch and plied the smaller skein in the back. 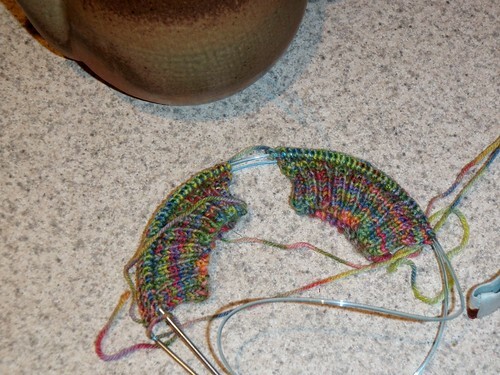 This is right after plying, I haven’t wet and blocked the yarn yet. I think it turned out pretty well – it’s not as super-even as I would have liked but it was spun over multiple days and in a bit of a rush. 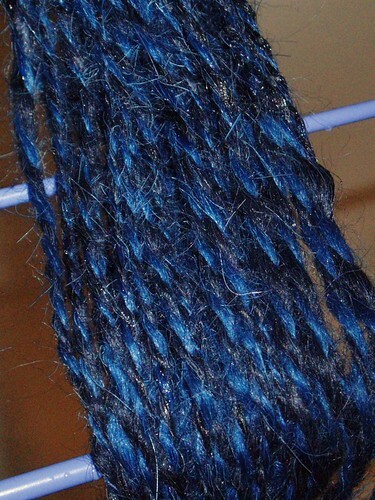 And it really is pretty even, other than a few places where the roving was a bit sticky – strangely this mostly happened on the parts that were dyed dark blue. 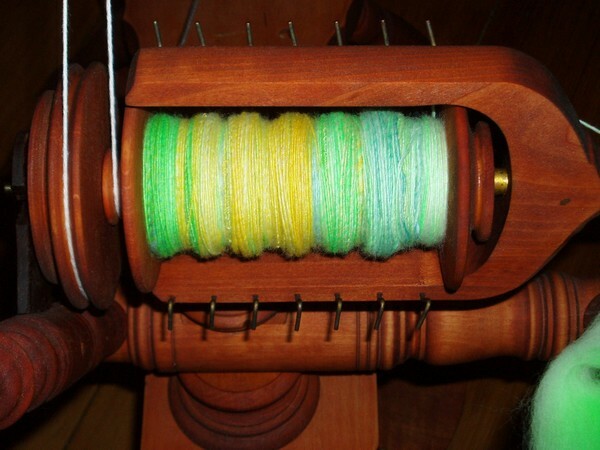 And as you can see the plying left a bit of a pool of yellow in one section. 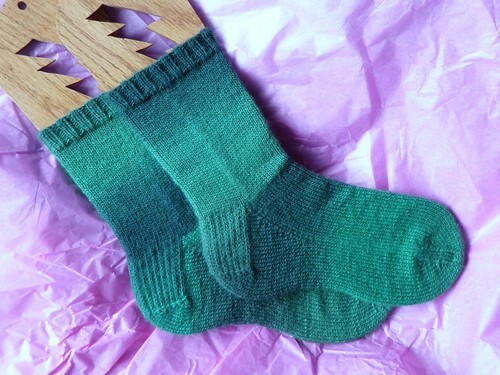 In any case, I’m sure the socks will be lovely. I also have a hat to show you! 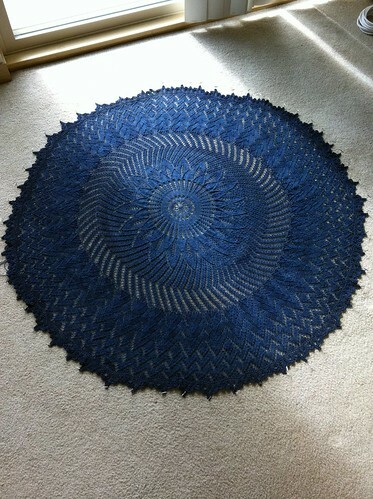 The amazing handspun Claudia is done. I haven’t been able to get a modeled pic yet because I haven’t had any fellow knitters to con into taking pictures of me wearing Claudia. And I’m just not that good with a camera timer. Maybe soon. In other exciting news, I don’t think it ever made it to the blog but I’m going to SPA this weekend. It was sort of an impromptu trip but I think it will be lots of fun. And I’m even bringing my wheel! 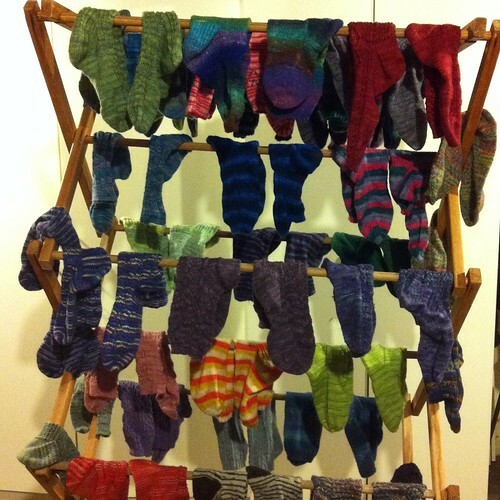 Last time I reported on all of the half done socks hanging around my house. What I didn’t tell you was that at the time that entry was written all except the Class Socks were on my desk. I like to keep half socks on my desk, that way when I get bored I can grab a different pair. 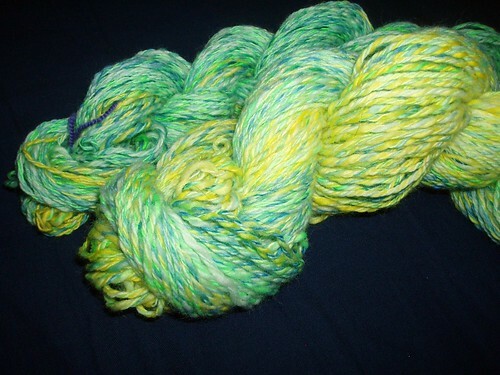 Also the variation in the yarn is only that visible under very bright light like, say, a camera flash. 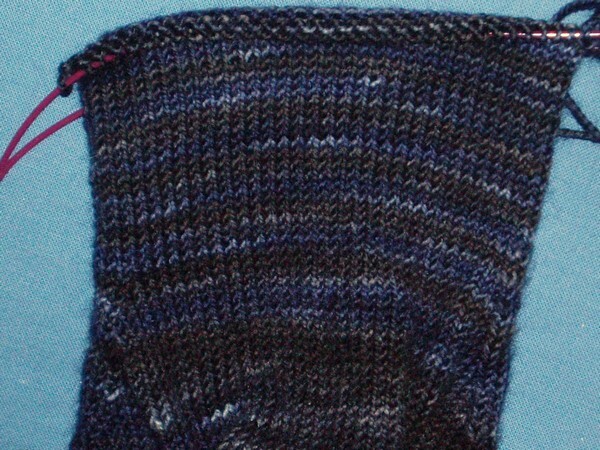 In normal light it looks like subtly variegated blue-black. I’m not totally sure what the fiber was since Rachel gave it to me without any sort of label, but I think it was an angora blend. It was pretty difficult to spin because the fibers were sticking together like crazy so I first had to split the batt into very thin strands so I could draft it at all. 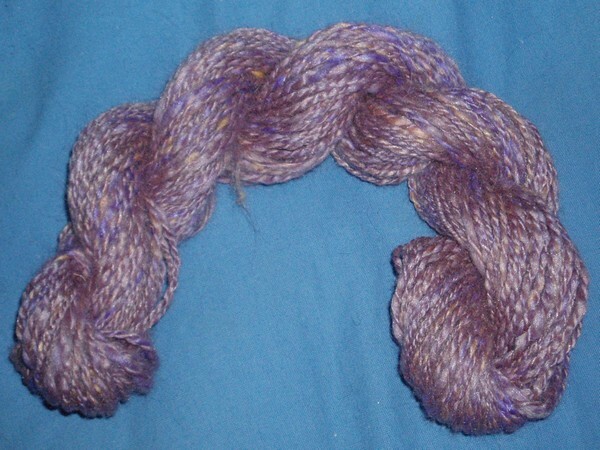 Consequently the finished yarn is a bit more thick-and-thin than my usual, but I think it turned out well.